Christmas days are undoubtedly one of the most special days of the whole year. And not only because of the holidays. But because of the dates, the atmosphere… Christmas is one of the most beautiful times of the year, you breathe a different climate where peace, friendship, family reunions, companionship and love stand out. Company meals, with friends, family gatherings, gifts … everything is prepared, to enjoy for a few days a unique way of our loved ones. The world, these days, is filled with a magical and special climate that makes light and warmth in the environment is a fundamental icon. As we said in the previous point, Christmas is a time that makes the world prepare in a special way to enjoy the peace and harmony that is breathed in the environment. However, in Spain Christmas culminates with the night of the Three Wise Men, a special and very much our own celebration. The 5th of January is one of the most important days of Christmas in Spain, mainly for children. The days leading up to it are full of nerves and excitement as we select the most perfect gifts for our loved ones. That night will be when, while we sleep, the Three Wise Men will leave the gifts under the tree next to the shoes of each inhabitant of the house. Thus, on waking up on the morning of January 6, the gifts will be opened as a family, a magical and unique moment for everyone, especially for the youngest members of the household. There are many rituals that are done tonight, according to the customs of each family, year after year follows the same ritual to prevent the Three Wise Men of the East forget us. That is why it will be very important that the days before we give the letter where we ask for our gifts to the royal page to make it reach the Kings. A very important and special day in the Christmas calendar. The night of January 5th in Spain is one of the most important of Christmas. That night is when the Three Wise Men of the East, Melchior, Gaspar and Baltasar will pass by all the houses to leave gifts. Tradition has it that you have to send the letter to the Kings putting the gifts they want to receive and mainly, if the children have been good throughout the year, the Kings of the Far East will leave them some gifts. For those who have not been so good there will be charcoal, so it is very important that during the year we are good. It is already a tradition that on the afternoon of January 5th the Three Wise Men arrive in the city of skyscrapers. A great parade with floats, music, candies and of course, the Three Wise Men on their thrones. It is a unique experience for children who enjoy seeing their Three Wise Men, knowing that that same night, they will enter the house and bring them their gifts. Also for adults who enjoy seeing how the little ones get so excited to see their Kings so closely and live this experience with the same illusion as them. The arrival of the Three Wise Men also arrives at Altea Dársena Benidorm Apartments. In our apartments you will be flooded with the Christmas spirit. Scenery, families and children who are looking forward to your gifts. 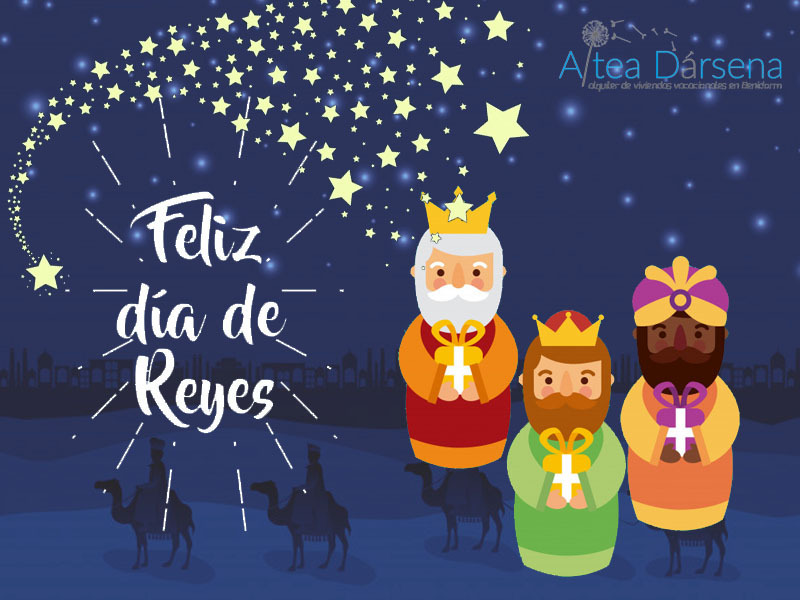 That’s why the Three Wise Men come to Altea Dársena with gifts! Take advantage of the great offers that we make for these dates. Packs for couples or families with everything included and great discounts. Do not hesitate any more, choose your best offer and spend the night of the Three Wise Men in front of the sea with Apartments Altea Dársena.